It’s time! Winter is here and it’s time to get your pantry ready for the holidays! The kitchen can be used heavily this time of year — there are celebrations, dinners, lots of cooking, and gathering. Is your pantry ready? First, you’ll need to go through everything, checking expiration dates, and taking account of what you have and what you may need. While everything is out, this is a great time to wipe all shelving with hot soapy water and really get the pantry area clean. Once it’s dry, you can use shelf liner or leave as is. Now, put the remaining, unexpired items back, organizing as you go. As you’re putting items back, are you finding that there is just not enough space? Or that items in the back aren’t visible and likely they won’t be used? Have you considered getting a new closet system? Wouldn’t it be nice to have the organization that you need? Custom shelving designed to accommodate your items. For example, if you keep your kitchen appliances in the pantry, then you most likely need deep shelving with plenty of vertical space to hold items such as crock pots, blenders, ice cream machines, etc. If you keep mostly food items in the pantry, then you may need a variety of shelving to hold canned goods, cracker boxes, dry goods, and liquids. Consider getting a free design consultation! Just Closets will sit down with you and design the pantry system that will best fit your needs. 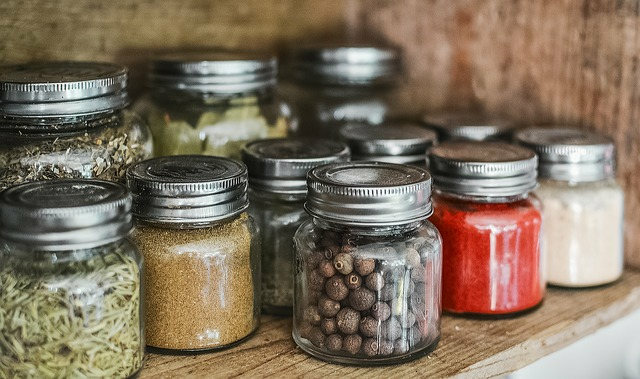 Now that you know exactly what is in your pantry, it’s time to make a list of the pantry items you’ll need for the coming holidays, such as flour, sugar, condensed milk, brown sugar, canned pumpkin, bread crumbs, cubed bread for stuffing, cake mixes, chocolate chips, spices, etc. Once you’ve got the pantry stocked, stand back and admire it! You’re ready for the days ahead of baking and cooking. Family and friends will no doubt join you in the kitchen and comment on how nice the pantry looks!